The M8 light armored car was the only significant wheeled combat vehicle used by the US Army in World War II. In conjunction with the lightly armed utility version, the M20, it was the staple of the army's cavalry squadrons for use in reconnaissance and scouting. First entering combat in Italy in 1943, it was widely used throughout the campaign in northwest Europe, though its off-road performance … was found to be wanting. 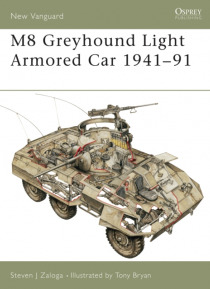 This title describes the design and development of the M8, covering the many variants that were produced during World War II and afterwards, along with a comprehensive survey of its operational use.